Banana Fairy Island as seen in Donkey Kong 64. Banana Fairy Island (also known as Banana Fairy Kingdom or Fairy Island) is a small island and the residence of the Banana Fairy Princess and the Banana Fairies. The island's only notable feature is the large home of the Banana Fairies. The building is shaped like a Banana Fairy's head and wings, with green ivy growing beneath the eyelashes on the front. Contrary to its size, the Banana Fairy head has a small entryway at the "mouth". The Kongs are too large to enter it except for Tiny, if she uses her Mini-Monkey ability from a nearby Tiny Barrel. There are also eight Crystal Coconuts lying around the island shore, the fifth Bananaport Pad of the Kong Isle hub, and a Golden Banana in a small jail behind the head. Tiny can open the bars and obtain the Golden Banana by firing at a Feather Switch on the right. 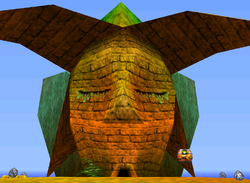 In the interior, the Banana Fairy Princess sits at her banana peel-shaped throne in front of an altar-based structure. Each corner of the room has four Crystal Coconuts. There is a fountain with numerous lily pads and two endless waterfalls on each side. There is a large wooden door on the right side, which has the Golden Banana with the Rareware sticker behind it. When Tiny first enters the building, she meets the Banana Fairy Princess, who is crying over the missing Banana Fairies. She gives a Banana Fairy's Camera to Tiny and the Kongs to retrieve the Banana Fairies and a unique shockwave ability. Much later, Tiny can obtain the Golden Banana contained behind the wooden door after she returns every Banana Fairy successfully. There is a glitch that allows the other four Kongs, Donkey Kong, Diddy, Lanky, and Chunky to enter the Banana Fairy Island's head by swimming underneath the island. ↑ The Donkey Kong 64 Player's Guide, pages 15-16 and foldout. This page was last edited on January 3, 2019, at 00:06.